My father would have been amazed to see the line of people who waited to greet my family at the funeral home following his death. Granted, his sudden demise as the result of a farm accident may have brought many of them, but I believe it was mostly a tribute to his quiet faith in Jesus Christ. In fact, he was a man who avoided the spotlight, serving when asked, but often working behind the scenes to accomplish a task. When I read the story of the Good Samaritan, I think of my dad. He would plow the widowed neighbor’s drive after a snowstorm because he could, not because she asked. He’d stop to assist a stranded motorist along a busy highway or go out of his way to provide transportation to church for an elderly couple who didn’t drive. He took the works part of his salvation almost as seriously as his faith, knowing it was what Jesus would do (long before the phrase became a popular buzz word). It seems that evangelical Christians have often left the service part out of the gospel. We focus on “winning souls” for eternity while the man living under the bridge a mile away doesn’t know where he’ll find tomorrow’s meal. We cross the ocean to give a cup of water to an orphaned child, but overlook the little boy down the street who missed a meal last night because his single-parent mother didn’t have enough money to buy groceries. We fail to see the needs of the tattooed and pierced barista who serves our coffee because we are so focused on our own “straight and narrow” walk. That’s why I like the Commitment to Common Mission (CCM), a document produced by the Charis network of Grace Brethren church leaders worldwide. Driven by our Christian brothers and sisters around the world, it calls those of us in North America to make disciples through church planting, to develop leaders in our churches, and to reach the lost by showing works that reflect true faith. It’s recognizing that the man under the bridge may not be able to hear the message of the gospel through the roar of his empty stomach or that conflicting world values may cause the barista not to consider that same gospel until someone shows him differently. 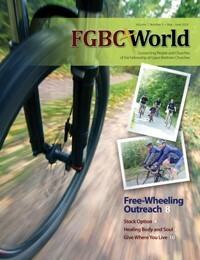 This issue of FGBC World looks at the third portion of the CCM – integrated or holistic ministries. It examines ways people in Grace Brethren congregations on our continent are carrying out the command to serve others and at the same time, drawing people to eternal life.